My generation grew up in awe of a handful of American designers. 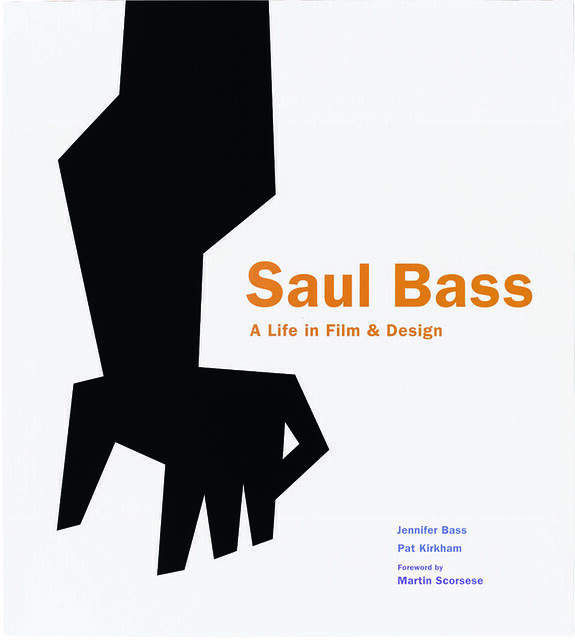 Pre-eminent among them was Saul Bass. He represented a combination of creativity, Modernism, romance, influence and commercial success that was the envy of many of us. In the years since his death in 1996, his daughter Jennifer has been collecting the material for a biography. Together with the design historian Pat Kirkham, and assisted by archivist Brad Roberts, she has created an impressive narrative and archive. This rich biography is more than ‘A Life in Film and Design’. The subtext is the story of America in the second half of the twentieth century, narrated through the progress of one individual. A kid from an immigrant family in the Bronx works his way up to the top of his profession, takes on corporate giants and transforms the way they look and interact with the world, becomes a Hollywood star in his own right, revolutionises how film titles are made, and sets a new creative standard for designers everywhere. It’s a very American tale. It is also a very personal story. The intimacy often missing from monographs on designers is palpably present here. Bass’s voice is recalled with singular clarity and the phases of his life and work are clearly delineated. For example, a spread on Elaine Makatura, his wife and collaborator, points to her significant involvement in the film work, and over time she may gain recognition for her own contribution, as Ray Eames has alongside her husband, Charles. There were other partnerships too. Art Goodman worked closely with Bass on the design work, as latterly did Herb Yager on managing his consultancy’s corporate clients. But it was always Bass who made it happen. The book reflects his prodigious energy and his broad spread of interests. One of the most interesting aspects of his work is the way in which he simplified forms and images by concentrating on essentials, without stripping them of meaning or depth. He was a storyteller, both in design and in life (the book records the many stories he told of the people he met, worked with and loved). the brands we recognise today. Part of his originality lay in the way he let corporate work influence his film work and vice versa. The animation of the Bell Telephone symbol from 1969 anticipates today’s corporate predilection for moving imagery. The graphic simplicity of his trademarks is carried over into his film work, turning the films into memorable brands – something quite revolutionary in the early days. Constant cross-pollination between genres is one of the main themes of the Bass oeuvre, and the book records this well. (It also demonstrates that Bass favoured capitals for titles. He would never have set a company or film title in lower case.) Alongside the well known film titles and graphic marks is some of his rarely seen early work, giving evidence of the designer’s steady development. The use of line, flat shapes and strong colours seems to date right back to the day the young Bass received a box of Crayola crayons as a present from his father. He made good use of them. For some, the heft of the volume and its generous, open layout may be too indulgent. But it is somehow in keeping with the scale of the man and his achievement. The design world has waited a long time for a substantial monograph on this influential twentieth-century Renaissance figure. The wait is over. Cover shows detail from the celebrated identity for The Man With the Golden Arm (see Eye 68). Book design: Jennifer Bass. 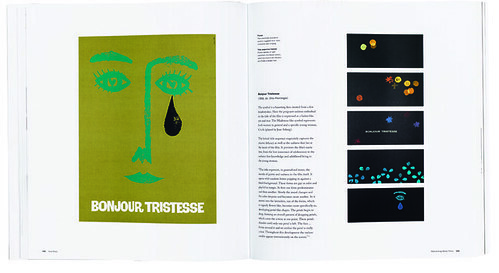 Top: Show poster and film titles for Otto Preminger’s Bonjour Tristesse, 1958.